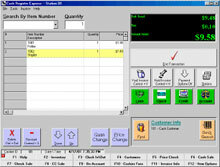 The Cash Register Express allows super-efficient point of sale processing. Manage inventory much more easily with automatic inventory reduction. The Cash Register Express is Windows-based and intended for retail stores, specifically video and other high-traffic/turnover enterprises. Not only can inventory be quickly updated, but this system can also establish membership and other user accounts right at the point of sale. The pcAmerica PCA-LIC-PRO-CRE is also known as PCA-LIC-PRO-CRE	or PCALICPROCRE	.